Wykeham - Somewhere in the South. Re: Wykeham - Somewhere in the South. bulleidboy wrote: I have now fitted the SR Home signal just in front of the tunnel exit from the fiddle yard. I have yet to wire it to the Cobalt iP point motor. I have been thinking about painting a "weathered" sighting panel behind the signal arm on the tunnel facing stonework. The short section of track on the right is a piece that was never lifted and will eventually be ballasted and heavily weeded. And what was a class 73 doing in Cardiff you might ask? Well. It had had its tyres reprofiled as Cardiff Canton was the cheapest place they could have it done. It was not the only southern 3rd rail unit to venture into Cardiff (And Wales). I once saw No. 1001 in a 4 car formation that was hired by Chris Gibb of Wales and West fame as it was the only unit available right round the country to work during a rugby special. It actually came in the platform that I was waiting to work my train to Maesteg on. My train was late arriving, and when I saw 1001 I was amazed... Then I thought " Much as I'd love to work it I have not signed it so I can't". It wasn't my train though. Mine was a few minutes behind. I was allowed to play today! The break in sound is as the polarity changes on the turntable. bulleidboy wrote: I was allowed to play today! The break in sound is as the polarity changes on the turntable. New Kernow Gate Stock arrives in Wykeham. The new BR Crimson Gate Stock behind Class 02 No.30182 about to depart from Wykeham. The new Hornby Wainwright Class H arrives at Wykeham. Not much work on the layout of late. I have been trying to get some of the electrics tidied up, so lots of time under the boards. Also some of the lighting aspects on the layout need tidy, permanent wiring installed - lots of long lengths of wire with a PSU on the end. I've had the Ratio SR Platform lamps out again, and have added some to "Manydown" - the branch-line station on the Wykeham layout. I used the shades under canopy and there are four inside the building - you can't see inside the station building, but I had them, and it was an easy job to mount them to a false ceiling inside the building - power inside the building was by copper tape, with a lead coming down through a hole in the platform and through the boards - it was then connected to a 3v bus. I hope to have some loco's actually moving in 2018 - I need to work on a timetable. I have extended that branch-line platform a little to take the Scenecraft Shillingstone parcels office - I bought it when buying the station building, but then found I was short of space. 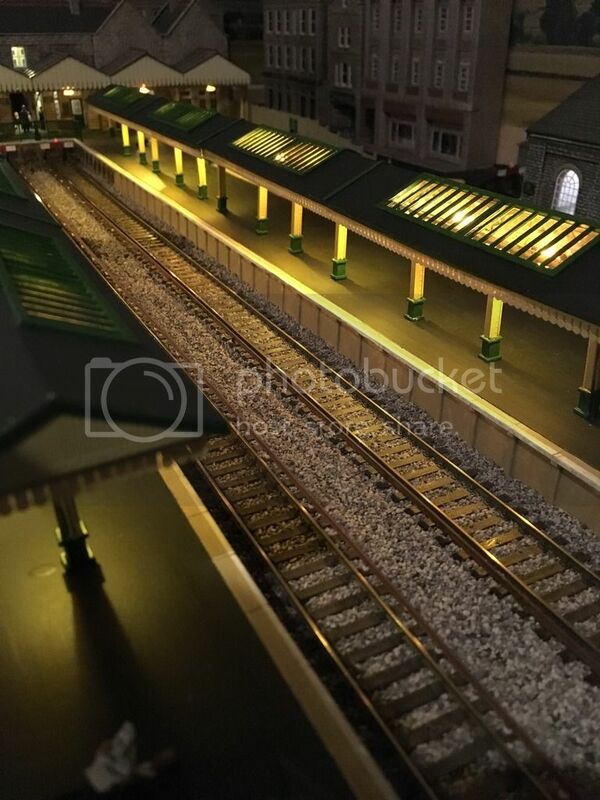 I have also added the final platform lamps - I need to get some lighting in the parcels office - next weeks job. There is also now a small car park at the end of the platform, next to the fiddle yard turntable which has now been fenced off. It the Southampton MRC exhibition this weekend, so may be a couple of early BR vehicles for the car park. The lights look a little "bright" but they can be turned down. Life has been very quiet at Wykeham for some months. I have now re-hung the room door so that it opens onto the landing rather than into the room. I'm hoping to get back to some serious work on the layout in the next few weeks. It's about time the hill/tunnel received some work, and I'm hoping to put a chalk cliff along the side of the hill behind the branch line. There are also some new yard-lamps to be fitted and wired-up in the fiddle yard. 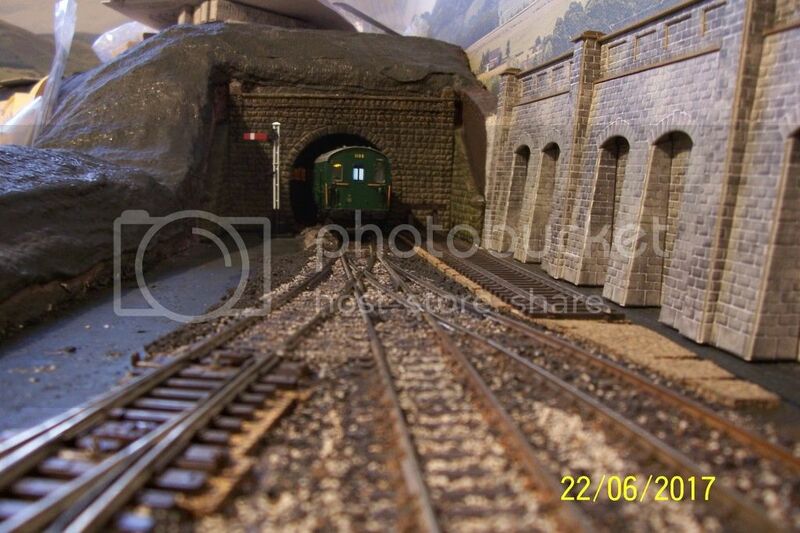 I'm also thinking about adding a third rail to the main line, running from Wykeham Station into the tunnel - this will allow a couple of other stock items too be run on the layout. So lots to do, just need to get the motivation up and running. I've started work on the chalk cliff by carving a large chunk of foam out of the hill - not sure how this will work out, but have now started adding some stratum(?) lines - foam dish cloth stuck in place with Polyfilla - not as messy as you might imagine! I will give the foam a few coats of Plaster of Paris and then a "wash" of a VERY diluted black, which hopefully will show up a few cracks and gullies, then some green scatter to represent weeds growing here and there. The base will be scrubland with large bushes and trees. I have been studying the chalk cliff inland from Portsmouth - you can get very close on Google Maps - picture (link) no.3. The worst scenario if it doesn't work, will mean building a new hill/tunnel. Wow, this is quite an undertaking. I read that track plan from Mr. Freezer some years ago, and this is the first time I've seen it done. After months of no work on the layout, I have started fitting 3rd rail to the main line in Wykeham Station. A fiddly job, but if you file the flange on the rail to a bit of a point, the Peco 3rd rail chairs slip on quite easily. The track and chairs will need painting - the suggestion is that the insulators should be white, but a quick look at those in Basingstoke Station, they are the same colour as the track - dirty! I also dug up some of the ballast and fitted magnets, just over a loco's length from the buffer stops. Hopefully this will allow uncoupling to be done easily with the Kadees. I've now added more 3rd rail. At the moment it has had a quick coat of rusty/brown paint. I had noticed looking at the real thing, that the rail is usually a greasy black, and despite the pick-up shoe rubbing the top of the rail, it remains black and greasy. I've tried a black marker pen which gives a black top, but will try a black wax crayon - that may even leave a little residue on the rail. The fitting of the 3rd rail has lifted the appearance of the track. It will run from the terminus into the tunnel. I have also fitted it to the terminus branch track - always the possibility of a 2-BIL coming in when the other two tracks are occupied. Last edited by bulleidboy on Mon Jan 14, 2019 10:23 pm, edited 1 time in total.